Mericana Wide offers stylish colours with a smooth or wire brushed finish. Available with our Insta-Loc locking system, this engineered hardwood is easy to install for today’s do-it-yourselfer. Annapolis Valley offers high styled visuals in wire brushed, handscraped and smooth finishes. This engineered hardwood includes a stable guard high density fibre core. Available in Oak, Hickory and Maple species. One of our most durable solid hardwoods, Madeira comes in 3 1/4″ and 5″ widths and boasts some of our best hardwood warranties. 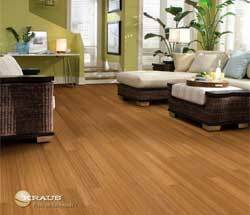 The soft scrape visual with tonal variety within the planks give Madeira character and charm. A Kraus favorite! Moselle features timeless design and great colours. This handscraped, solid hardwood is available in 4 3/4″ and 5″ widths for those that are looking for a classic wood look.